The staggering rate of mobile device adoption today gives content and collaboration (C&C) professionals a good reason to plan ahead for offering mobile access to enterprise content. Demand for the devices today likely means demand for access to enterprise content tomorrow. C&C pros must frame mobile strategies around business, transactional, and persuasive content. While a few enterprise content management (ECM) and third-party vendors have developed mobile support, options remain immature, leaving many firms to develop customized applications for mobile ECM. 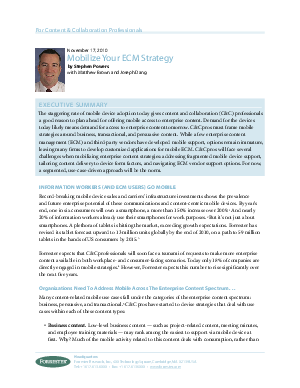 C&C pros will face several challenges when mobilizing enterprise content strategies: addressing fragmented mobile device support, tailoring content delivery to device form factors, and navigating ECM vendor support options. For now, a segmented, use-case-driven approach will be the norm.